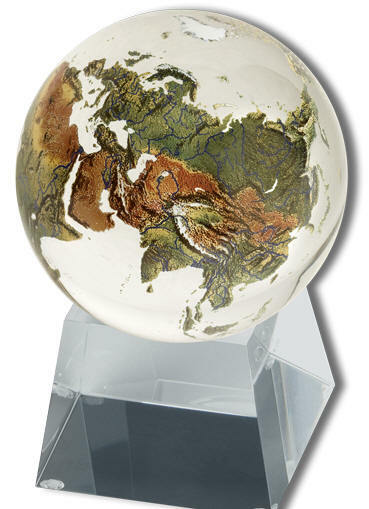 Unique crystal world globe is geographically accurate and is handmade of crystal with full-color natural Earth imagery. Discover extraordinary details of hundreds of islands and rivers, lakes, ice caps, deserts, rainforests and mountain ranges. Expertly hand-fired in the USA, this crystal Earth sphere will become a cherished keepsake, to be passed down for generations. Crystal Sphere Diameter : 3"
* A portion of sales generated by this globe is donated to the Mount Shasta Bioregional Ecology Center, a non-profit educational organization.